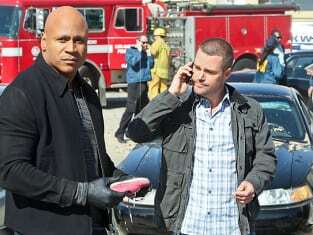 It's not the threat of a terrorist act that gets NCIS on the move during NCIS: Los Angeles Season 5 Episode 23. There was an actual bombing at Venice Beach that killed two people and injured many others, including children. Before the team even began their investigation, ZNN Reporter Dana Steele broadcast that the JLF were responsible for the bombing. The organization hadn't claimed responsibility for it, but she reported it based on information from her source. She thwarted NCIS's investigation by sending them after a fake source. The episode brought to light the responsibility of the press to be careful with their reporting, especially when lives on are on the line. She placed the blame on the wrong group and then hurt the investigation. In the end, the only additional life lost though was her own. Dana's irresponsible declaration ultimately killed her. Instead of broadcasting a correction or considering it when the real bomber approached her, she worried more about her own integrity, job and ego. In a twisted way, her actions helped NCIS find the actual bomber and prevent them from bringing down the building in downtown LA. When Sam and Callen followed her to find her source, they found the bomber when he approached her. He was obstinate and immediately took responsibility for the terrorist act. His reasoning for the bombing was logical and frightening. He killed people on the beach in order to trigger a US military response in his homeland of Sudan. Crazy, right? Yet, it may well have worked. The problem was that his history indicated it was an isolated terror event unrelated to the activity happening in the Sudan. I'm not sure how he thought he'd be able to cover that up and make it seem like a broader terrorist attack linked back to activity in Sudan. It was a close call, but Sam and Callen were able to stop the other two Sudanese men from setting their bombs off. It ended up being a win for NCIS. Though, I was left nervous for the finale. Throughout the season, the team has nearly escaped death and they continue to get put in extremely dangerous situations. Between the love notes left by Nell and Eric and Hetty's final words, the foreshadowing of doom was strong. "They always come back, Owen. Until one day they don't." Will a NCIS team member die in the finale?